If you are looking for the documentation of the deprecated version of InstaLOD for Autodesk 3ds Max, you can find it here. This page will help you to get up to speed with InstaLOD for Autodesk 3ds Max 2019. InstaLOD for Autodesk 3ds Max enables you to optimize 3D meshes without having to leave your favorite DCC tool. The integration features a graphical user interface, supports complex batch operations and can be scripted with its MAXScript scripting-based API. Great care has been taken to ensure a high degree of usability and productivity, even when using InstaLOD for Autodesk 3ds Max for the first time. Please refer to the InstaLOD Pipeline 2019 documentation for an overview of all features. The following versions of Autodesk 3ds Max are supported: 2014, 2015, 2016 ,2017, 2018, 2019, 2020 and later. 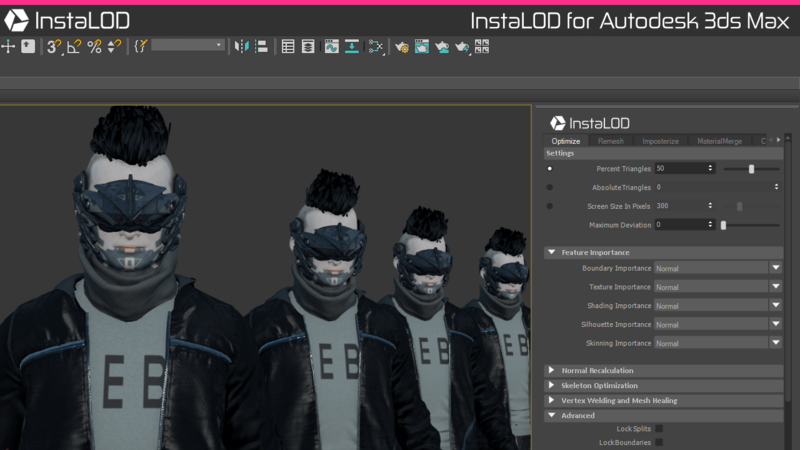 InstaLOD for Autodesk 3ds Max uses InstaLOD Pipeline as backend for optimization operations. InstaLOD Pipeline must be installed before you can start using InstaLOD for Autodesk 3ds Max. Please refer to the InstaLOD Pipeline 2019 documentation on how to install InstaLOD Pipeline on your workstation. InstaLOD for Autodesk 3ds Max supports authorizing licenses and displaying license info from within 3ds Max. Once you have installed and authorized InstaLOD Pipeline on your workstation, unzip the InstaLOD for 3ds Max file. Copy the InstaLOD_3dsMaxIntegration.ms and InstaLOD_3dsMaxIntegration.cs files into your 3ds Max startup scripts folder \scripts\startup, normally found within your 3ds Max user folder at \Users\AppData\Local\Autodesk\3dsMax\<3dsmax-version>\<3dsmax-language>. More information on how to install startup scripts can be found in the Autodesk 3ds Max Documentation for Startup Scripts. Once the integration’s script file is copied to your 3ds Max’s scripts folder, you can start 3ds Max. The script will automatically create an InstaLOD menu item which can be used to spawn the InstaLOD window. If the InstaLOD window has been closed, it can be spawned again by selecting InstaLOD->Open Window... from 3ds Max’s main menu. On the first start of InstaLOD, it is necessary to point InstaLOD for 3ds Max to the installation directory of InstaLOD Pipeline. Click the Browse...-button and browse to the InstaLOD Pipeline installation directory on your workstation. If InstaLOD Pipeline was found in the specified directory, the window contents will change. If your machine has already been authorized for InstaLOD, you can start using InstaLOD for Autodesk 3ds Max now. If your machine has not been authorized for InstaLOD yet, you can enter your license information in the dialog to authorize your workstation. To optimize a mesh select the mesh in the viewport or hierarchy. Select the Optimize-tab in the InstaLOD window and enter the percentage of triangles for the output mesh in the Percent Triangles text field. Click the Optimize Selected Meshes button to optimize the mesh. 3ds Max will export the geometry for InstaLOD and start the optimization. Once the geometry has been exported, InstaLOD will execute the mesh operation asynchronously. Both skeletal and static meshes are supported by InstaLOD for 3ds Max. 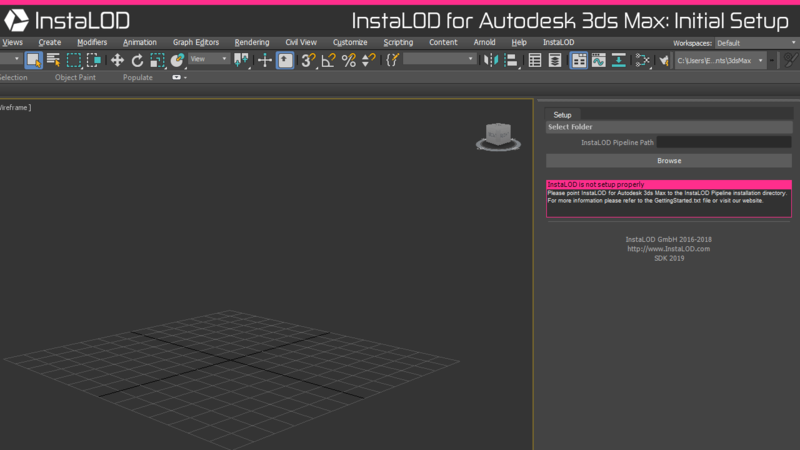 The image above shows the UI of InstaLOD for Autodesk 3ds Max docked to the right side of the window. The InstaLOD window can be docked and undocked like other native 3ds Max windows. 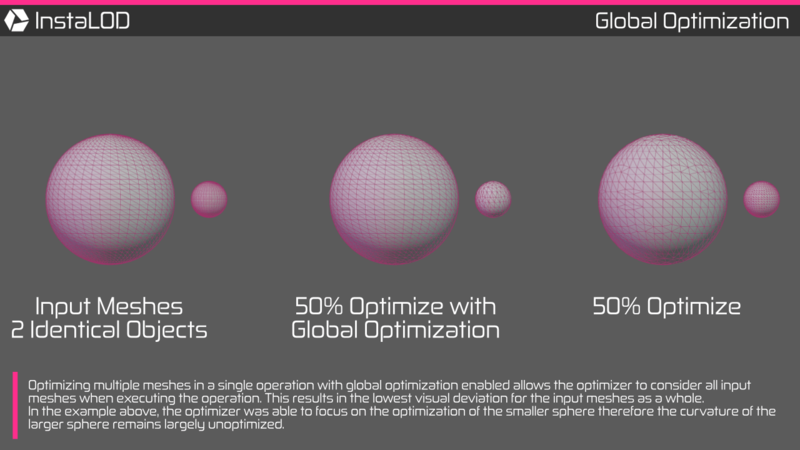 Optimizing multiple meshes in a single operation with global optimization enabled allows the optimizer to consider all input meshes when executing the operation. This results in the lowest visual deviation for the input meshes as a whole. Global optimization is enabled by default, but can be disabled by unchecking the checkbox in the Advanced Settings found on the Optimize-tab. Optimizing multiple meshes works identical to the optimization of a single mesh. Select all meshes to be optimized in the viewport or hierarchy, enter the optimization target value and click the Optimize Selected Meshes button to optimize all currently selected and visible meshes. By right-clicking the mesh operation execution button and selecting Save as Batch-Profile..., the current mesh operation settings will be saved as batch profile inside the directory of your InstaLOD Pipeline installation. On the Batch-tab saved profiles can be selected and executed on the current mesh selection in parallel. This is a great way to create a complete LOD chain with a single click. To delete a saved batch profile, open the Batch-tab. Right click the Execute Batch button and select Delete Selected Batch Profiles to delete all selected profiles. Another great feature of InstaLOD for Autodesk 3ds Max is the ability to create and export multi operation batch profiles for InstaLOD Pipeline. To export a multi operation batch profile, open then Batch-tab and select all saved batch profiles that will be included in the multi operation. Right click the Execute Batch button and select Export As InstaLOD Pipeline Profile... to export the profile for InstaLOD Pipeline. InstaLOD for Autodesk 3ds Max can be scripted using both Python and MAXScript. The integration’s callback system enables developers to prepare texture and geometry data before submitting it to InstaLOD for optimization. One such example would be custom materials that are flattened and converted to layered standard materials during the pre-optimization callback and converted back into a custom material in the post-optimization callback. InstaLOD for Autodesk 3ds Max provides two callbacks that are invoked pre- and post-optimization for each object used in the operation. To hook into these callbacks, simply implement the MAXScript functions listed in the table below in the global namespace. The InstaLOD_Event_WillExecute callback will be invoked during an undo chunk, so it is recommended to perform operations only on objects that fully support undo. Once control returns back to 3ds Max, the undo chunk will be rolled back and the object will be reverted to its original state before running the optimization. When using InstaLOD for 3ds Max via Script (MAXScript or Python) it is necessary to invoke the MAXScript function InstaLOD_InitializeGlobals() prior to using any of the optimization functionality. InstaLOD for Autodesk 3ds Max saves all settings that are relevant to building optimization profiles in a .NET dictionary which can be accessed through MAXScript. The settings identifiers used by InstaLOD for Autodesk 3ds Max are listed in the FieldDictionary within the static Settings class inside the InstaLOD_3dsMaxIntegration.cs file. The naming convention for the settings is INSTALOD_ID_[type]_[field] where [type] is the mesh operation type and [field] is a corresponding settings field e.g. INSTALOD_ID_OP_PERCENTTRIANGLES. The [field] names are matching the names of variables defined in the InstaLOD C++ SDK. Determines whether the current InstaLOD Pipeline Path is valid. Returns a string containing InstaLOD license information. This function requires the InstaLOD Pipeline path to be setup. Optimizes the specified modelObject. Optionally, an externalProfilePath file path can be specified to load a JSON profile from disk. If no externalProfilePath is specified, a profile will be built from the settings. Optimizes the specified selectedMeshes. Optionally, an externalProfilePath file path can be specified to load a JSON profile from disk. Before an optimization can be started via script, the InstaLOD settings need to be setup to match the desired operation. The following MAXScript example sets the mesh operation type to Optimize and optimizes a mesh with the name Sphere to 50% triangles. InstaLOD for Autodesk 3ds Max does not provide a native Python API. However, invoking the MAXScript API from Python works as a quality workaround. The following Python-example sets the mesh operation type to Optimize and optimizes two meshes with the name Sphere001 and Sphere002 to 50% triangles. There are currently no known limitations. Please visit http://www.InstaLOD.com to stay up to date! Thank you for using InstaLOD. Start your risk-free evaluation of InstaLOD now! The evaluation gets you unrestricted access to the entire InstaLOD technology stack: from InstaLOD Studio XL to the InstaLOD C++ SDK.